Not being an attorney makes me a mere “layperson” for many in the legal profession, and therefore, unqualified to comment on the matter. But this “layperson” thinks that the legal profession should be embarrassed, and ashamed, of the lack of reasoning underlying Mr.Holder’s decisions. In the interest of “fairness”- and hopefully as a means of bringing clarity to the situation - let’s get some things straight from the get-go. The five 9-11 conspirators in question have been held all these years in a facility known officially as the “Guantanamo Bay camp.” And the use of the word “camp” matters profoundly. If the Guantanamo Bay facility were, for example, a “prison,” then it follows that those being held there would be “criminals.” If, on the other hand, the Guantanamo Bay facility were defined as a “POW camp,” then those being detained there would be “enemy soldiers,” and would be subject to “rules of war” set forth in international law. Yet, in fact, the thugs at Guantanamo Bay are neither “criminals,” as we have historically defined them in the West, nor are they “enemy soldiers” or “prisoners of war.” They are something the likes of which we have never dealt with before, and as it appears to this mere layperson, neither U.S. law nor international law adequately contemplate how they should be addressed. Some of this legal ambiguity was evident in the public rhetoric of our previous President. George W. Bush frequently stated during his eight years in office that the U.S. was engaged in a “war on terror,” while at the same time claiming that our nation’s mission was to “hunt down the terrorists and bring them to justice.” To us laypeople, that seemed like a U.S. President assuring the world that America would be the “good guys” even while under duress, yet at the same time we would not allow ourselves to be undercut. But in legal-speak, it would seem that Bush’s remarks could be construed as contradictory. By legal definition, a war is not a legal proceeding, and what happens on the battle field is not the same thing as what happens in a criminal investigation. So now we’re in the era of Obama. And while in the face of a Muslim Army Major murdering 13 of his fellow soldiers President Obama insists that we must not “rush to judgment,” Obama’s Attorney General Eric Holder has nonetheless “judged” after ten months that these five 9-11 conspirators need a civilian trial. And Mr. Holder’s vacuous responses to even the simplest of questions should be deemed “unacceptable” by all Americans – even attorneys. What happens to Khalid Sheikh Mohammed, if he is acquitted? 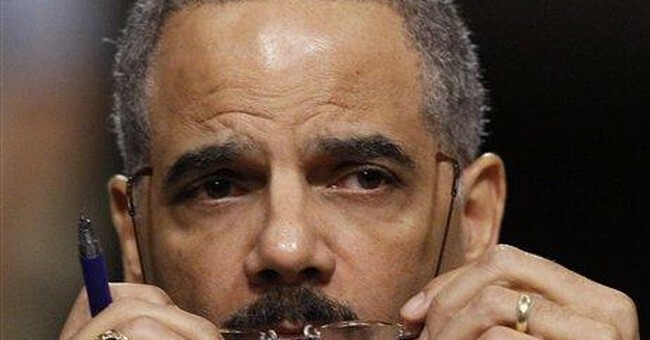 “Failure is not an option” Mr. Holder explained in a Senate inquiry. Oh yeah? What about that thing called “due process?” Has the outcome of this trial been pre-determined? Are we to understand that “the fix is in?”Even a lay person like me can see that the outcomes of court trials are often highly unpredictable. Has an enemy combatant ever been granted a civilian trial before? Holder assured the inquiring Senators that he would “have to look at that” – which meant that either he hasn’t “looked at that,” or that the honest answer would not support his decision. And how could Holder be so certain of a conviction in a civilian trial, when Mohammed had already plead guilty in a military tribunal? Holder couldn’t answer that either. And then there was our President, Barack Obama, who also stated that KSM will be convicted and executed. But what did that mean? Was this the President merely expressing confidence that his vision would become reality, as politicians so often do? Or was this the Executive Branch of our government pr-determining what the judicial branch will and will not do? To those in the legal profession – where are you at with all of this? Are we talking here about a mere “show trial?” Is the American Bar Association okay with the Executive Branch running over the top of the judiciary? For us mere “laypeople,” the thought of President Obama and Eric Holder pre-determining the outcomes of civilian trials is a very chilling proposition.